Recognized for over 50 years as the best-paced and most comprehensive guitar method available, Alfred's Basic Guitar Method has introduced over 3 million beginners to the joy of playing guitar. This updated and expanded edition features a new layout, making it easier to read and learn. Now included are blues, country, folk, jazz, and rock styles, plus more pop songs! New DVDs with iPod-compatible video are now available for the visual learner, and correlating theory, chord, and pop books ensure that you'll get everything you need from one complete method. Learning to play has never been easier or more fun than with Alfred's Basic Guitar Method---the first and best choice for today's beginning guitar students. 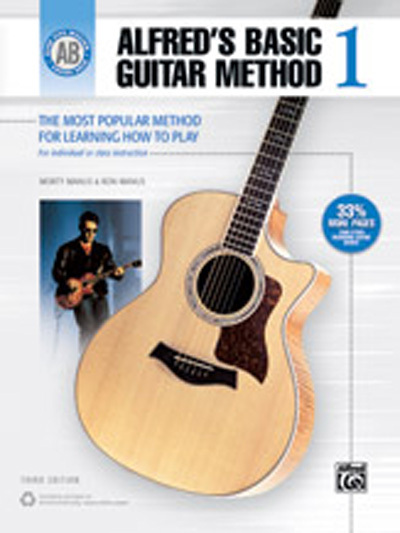 Book 1 covers how to hold your guitar, tuning your guitar, basics of reading music, notes on all six strings, chords, scales and songs, bass-chord accompaniments, duets, photos and diagrams, and acoustic and electric guitars. Titles: Singin' in the Rain * Take Me Home Country Roads * Over the Rainbow * Annie's Song * When the Saints Go Marching In.